One of my clients sent me an email last week asking if she should accept a new affiliate opportunity she'd just received an email about. I love that she felt comfortable enough to ask my advice, but I did not give her a direct answer. Instead I gave her these guidelines by which she could evaluate the opportunity for herself and her audience and make her own decision. I am faced daily with many great causes to be a part of. So many of our friends have written great books or offer courses, and while I like to promote everything, I simply cannot do justice to all of it. Here are the rules I go by to make a decision about which affiliate products I will promote. 1. Do I love the product or the person/brand behind it? Do I know and love the product? Do I know and trust the people behind it? Even if you have never heard of xyz product, if I am excited about it because I have used it and love the results, you can catch on to the excitement. However, if I am not excited, you probably won't be either. Sometimes I get to promote products not because of having used them but because I know and trust the creator of the product. If I can endorse the person/brand wholeheartedly, that goes a long way. In the ideal world, I would want the product to meet both of these if I am going to promote it. For example. I have met Crystal Paine in person. I have had informal conversations with her, heard her speak, read her blog and her books. I love the heart of service she has that shows through everything she does. 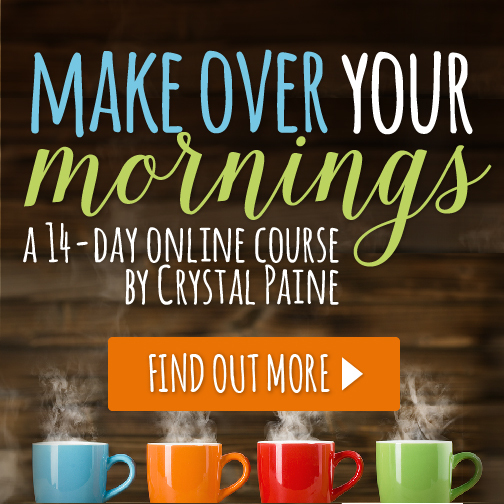 I can confidently promote her Make Over Your Mornings Course and her books because I have used them, read them, love them, and I have great respect for the author as well. 2. Would I recommend it in real life conversation, even if I were not an affiliate? This criteria is not far from the first. If the product is one I have used, and enjoyed, I am probably already talking about it in real life conversations with friends, even though that does not gain me any monetary return. 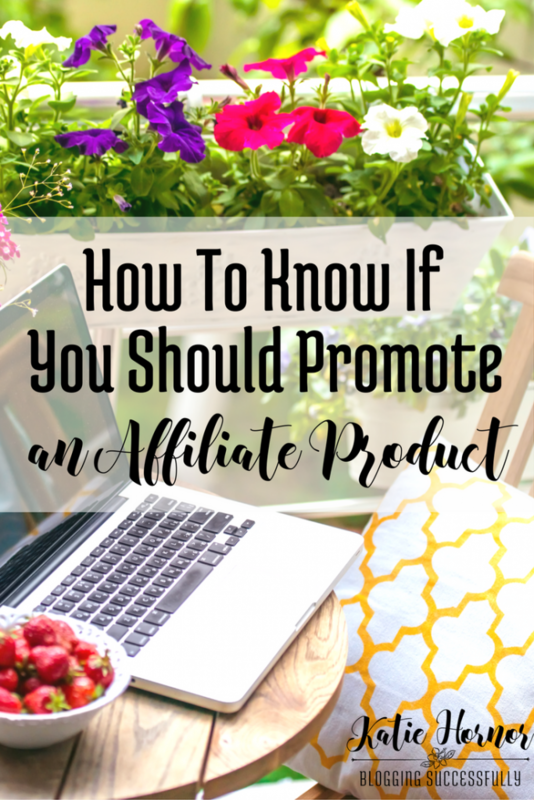 The products you find yourself raving about on and offline – those are the ones that might make a great affiliate product to promote. I love Mom Web's hosting service. They are affordable, polite, on call 24/7 and have extremely patient and helpful customer service. I am an affiliate for them, because I find myself recommending them to everyone who asks me about hosting, whether on or offline. You can check out their awesome rates here. 3. Does it fit the interest of my readers? Solve a problem for them? Many bloggers and online business owners I know have created their own products and/or take their own photos for their blog/website. SHOTBOX™ is a product I not only use and love, but I also know that it solves a problem for my audience. With SHOTBOX™, bloggers save both time and money because they can take perfectly lit professional photos of products, projects, food, documents and all kinds of other things using just their iPhone camera or DSLR. Check it out here. 4. What does the promotion require? Some affiliate programs are very laid back about how much or how often you promote their products. After all, if you don't make sales, you don't get commissions, no skin off their backs. However others may require a certain # of sales in a certain time period to remain an affiliate and/or they may have big campaigns that they want you to participate in with emails and social media posts, blog posts, etc. I have to look at my editorial calendar and consider if I have the time necessary to put into the promotion of the product, and also evaluate whether the time spent promoting will be worth the potential return in commissions. This month I am going to be promoting a free video by Kelly Snyder that is helping professional women all over the world dress to “look the part” and fee confident. The Rule of Four Video breaks down a very specific formula that stylists use to make an outfit look “put-together”. This combination of accessories, patterns and layers creates the “Pinterest-Worthy” outfits we see online. Kelly is sharing this very helpful video as part of the launch of her e-course Adore Your Wardrobe. I have learned so much from it and am excited to get to share it with you all! 5. Does it fit my promotional calendar? I will also look at my promotional calendar. If I am promoting my own products to my list, or have committed to other email promotions, it may not be the right time to add this campaign because I don't want to overload my readers' inboxes and risk them unsubscribing and/or reporting me as spam for sending them too many promotional emails too close together. I try to only schedule one large (serveral email sequence) affiliate promotion per month, and often have it planned out well in advance. If it's just social media posts, then that may be a lot more doable.